The ever-controversial Nicklas Bendtner have come out to apologise over the ugly incident he was involved in over the weekend. 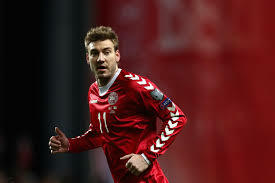 The Rosenborg and former Arsenal striker was said to have broken the jaw of a taxi driver early on Sunday. At the time the news surfaced, there was no much detail on what led to the brawl which saw the victim requiring a surgery. Awww! In the midst of our confusion as to whether this actually happened or not Bendtner has issued a heartfelt apology to his fans and teammmates for what he termed a regrettable act. "I was involved in an extremely unfortunate episode at around 2am on Sunday", the Denmark star said. Bendtner's girlfriend who was out with him on that day has backed him saying his guy only acted to defend himself and her after the driver came out of his car with a bottle which he threw at her. According to the taxi firm's management, Bendtner's statement is false. It says it has got enough evidence which it has handed over to the police.